What Is Soda Lime Times? Soda Lime Times is an on-line magazine, sometimes called an "ezine," that is published on the first day of every month. 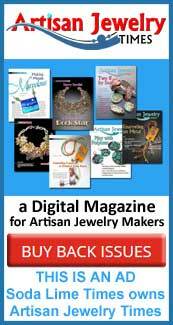 The magazine is primarily for lampwork beadmakers, and those who use lampwork beads to make jewelry and other interesting and unique things. 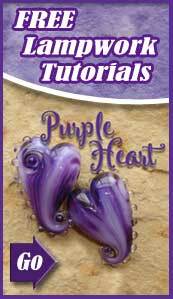 It is intended to be informative, entertaining and inspiring to all beadmakers, but especially to those with skill levels of novice to intermediate. The magazine is published by lampwork beadmakers for lampwork beadmakers worldwide. It is live on our website on the 1st of each month and if you do not unsubscribe from our newsletters, you will get an email from us on the 1st of each month reminding you to retrieve and save your copy to your computer. Is the magazine just an ezine or is it available in print? The Soda Lime Times is an ezine, meaning that it is in PDF format. Print magazines are expensive to produce and would require us to sell each issue for a much higher price. Because it’s a PDF, you get to decide how much of the magazine you want to print. With print costs going up every year it’s nice to be able to offer our readers 60+ pages of quality material each month for just $4.95. We haven’t raised our prices since we launched in 2011, and we don’t intend to. Subscription is a two-part process. First, click on the "subscribe" button. You are asked to configure your membership account by providing a username, password, email address, and your real name. Then you get to decide whether you want a month-to-month subscription or a yearly subscription, and whether you want to pay using PayPal or a credit card. None of your credit card or PayPal information is stored on the Soda Lime Times website; it is all securely stored and maintained by PayPal or our credit card processor. Once payment is made, you are returned to the Soda Lime Times website where you may use your username and password to log in. Going forward you will be re-billed by PayPal or Authorize.net each month on the monthly anniversary date of your first payment. For instance, if you subscribed on the 12th of the month, you will be re-billed on the 12th of each subsequent month for as long as you wish to remain a subscriber to the magazine. You may cancel your subscription at any time. Either in PayPal or by emailing us at support@sodalimetimes.com. If you have a yearly subscription we do not automatically re-bill. We give you the option of continuing your subscription, or not. Because of the way our billing cycle is set up, unless you subscribe on the first day of the month, you will always receive your issue before you are billed for that month. For example, if you subscribe on Jan. 12th you will get the Jan. issue which was published on Jan. 1st. Then you will get the Feb. issue on Feb. 1st, but won’t be billed for it until Feb. 12th. When your subscription expires or payment fails, you won't have access on Feb 13th unless you resubscribe. DO NOT create a new account (a new login) but just use the Renew button in your membership profile. How do subscribers download the magazine? From the Home Page, sign in and you will be taken to the subscriber’s page. Once there, look for the "Get Current Issue" button. Click on the button and the current issue should load. You may read the issue online, or download it to your computer but we ask that you save it to your computer so we don't have to keep sending issues that weren't saved. Please save them to keep down costs of customer support tickets and keep down the costs of SLT to you. You may also print the issue for your own use. See below for information about our copyright and questions about sharing. Just make sure to save the issue to your own computer (not just the link because the links will change each month). I tried to download the current issue, but the previous issue comes up instead. What do I do? Each month we replace the previous issue with the current issue on the 1st of the month at 12:01am EST. If it is after that time, and you are seeing last month's issue, refresh your browser to release some cookies/cache. On a windows computer this is done by hitting your F5 keyboard key. You can Google how to do the same with other operating systems. Do you have any advice about how and where to save my issues? We sure do! We receive many emails from readers whose computers have crashed or been infected with a virus and they have lost their Soda Lime Times issues. We are happy to replace them when this happens, but if you save your SLT issues (and any other tutorials you purchase from other artists) onto an external thumb drive, iPad or other device, they will be safe in the event of a computer malfunction. Thumb drives are less than $20 and will hold years’ worth of Soda Lime Times issues. Why is some of the web site only available to subscribers? Access to some of the features of the web site and to the monthly magazine is available only in the subscriber’s area. This is a feature and benefit of being a subscriber to the magazine. We will still have lots of free stuff for those that want to visit our site. But, over time the web site is intended to become a more and more valuable resource for the subscribers. Why does PayPal say they need my credit card, if I only want to use my PayPal account to subscribe? PayPal provides an instant payment to Soda Lime Times when a subscription is created. PayPal’s policy is to secure the payment via one of three sources so that an orderly culmination of the transaction may occur. PayPal will first look to any available balance in the subscriber’s PayPal account; then, from the subscriber’s verified bank account; and third, from a credit card attached to the Subscriber’s PayPal account. If a credit card has not been listed on the account, PayPal asks that one be listed at the time of subscription to provide a backup in case the first two options fail. The credit card is only used if the first two sources of payment are not possible and do not fund. A debit card is also acceptable and is treated just like a credit card. It is important to keep your credit card information up to date with PayPal even if it is just a back-up funding source. They will notify you when your card is getting ready to expire and then you can go to PayPal and update it. Doing so will ensure that your subscription will uninterrupted. I got an email from PayPal about my Credit Card expiring, but I ignored it. Now my payment to the Soda Lime Times failed. What can I do? First of all, don't worry. This happens all the time since many people think those emails from PayPal are spam. Once your credit card information is updated, your subscription should continue uninterrupted. PayPal rebills every three days, so wait at least three full days (or four) before you will notice your subscription renewal. DO NOT RESUBSCRIBE during those four days and contact us at support@sodalimetimes.com if it doesn't update. DO NOT RESUBSCRIBE OR YOU MAY BE BILLED TWICE FOR TWO SUBSCRIPTIONS FOR YEARS UNTIL SOMEONE NOTICES IT. My subscription was cancelled. What happened? First, we want to assure you that we NEVER cancel a subscription unless we are correcting something with your account. Because PayPal (or Authorize.Net) are our payment processors, they cancelled the account automatically when they were unable to collect the payment. They will try three times over an 11-day period. In most cases this is due to the subscriber’s credit card expiring and not being updated (see above instructions), or a new card being registered with PayPal, but not linked to the Soda Lime Times. A subscription can also be cancelled if a subscriber’s credit card was stolen, lost or compromised in any way. Don’t worry. It’s easy to fix. Fortunately, it is very quick and easy to re-subscribe, and you can even use your same username and password. First, you will need to go to Pay Pal and make sure your card is updated as instructed above, if you want to use PayPal to subscribe. Then come to the Soda Lime Times and re-subscribe. Just log into our site at www.sodalimetimes.com and click Add or Renew a Subscription. Follow the instructions and you will be taken to PayPal where you can complete your subscription in just a couple of minutes. Make sure to click save, and your re-subscription is complete. You should not have to do anything more until it is time to update your credit card information again in a few years. Some of you are asking about suspended payments. Skipped payments in paypal are a separate issue from suspended recurring payments, and some of you are asking about the difference, and how to know what it means when Paypal sends you a suspension notice. SKIPPED PAYMENTS: are usually a time-out communicating between Paypal servers and your bank/credit card company servers. The system retries again in 5 days, and it usually goes through the second time. If not, it will try once more, five days later. SUSPENDED: means Paypal couldn’t get money via your Paypal account payment sources – either insufficient balance, or out of date or inaccurate bank/credit card info (e.g. expiration dates), or a mismatch in the contact/phone info that Paypal has vs. what your credit card company has on file. The result is suspended payments (and a membership that will expire at the end of the term). If there’s confusion as to what’s wrong in the Paypal account, the user must contact Paypal support directly. Soda Lime Times has no access to your financial account with Paypal or your Bank. SEE ALSO STEPS BELOW! CANCELLED: usually means the user voluntarily cancelled a membership, and it expires or we cancelled a subscription for you. Suspended payments refers to the issue documented here and, by US Federal law, we have no access to the specific deficiency in your payment info or a means to correct it in Paypal, and it cannot legally be provided to us by Paypal Support - it can only be provided directly to you. So, if your payments are "suspended", we are referring (as we always have) any suspended payments users to Paypal Support to get the specific reason and resolution for their Paypal account. This would be the same with *any* payment processor, not only Paypal, and is essentially the same as a card being declined at the cash register in a store - it could be as simple as an outdated phone number on the Paypal or credit card or bank account, a zip code mismatch, or a change in expiration date, a routing number change, etc, or just info that isn't fully confirmed. While we understand it's not your intention to cancel your membership, by law SLT Support cannot intervene, so we recommend resolving the issue with Paypal Support. Click "Profile" near the top of the page. Click "Update" beside "My preapproved payments." You can view the status of your subscription under "Status." Active: There are still payments scheduled for the future. Suspended: Payments have been temporarily stopped. Canceled: This subscription is canceled and no further payments can be made. Failed: The payment could not be completed. This payment may be reattempted. Billed: The subscription payment due for this billing period has been issued. To be billed: The subscription payment due for this billing period has not yet been issued. Completed: The final subscription payment has been completed, and there are no payments scheduled for the future. Click "Update" next to "My preapproved payments" on the "My Money" tab. Select the merchant whose agreement you want to reactivate and click "Reactivate." Since you have your own Paypal account as a Paypal user, Soda Lime Times cannot reactive your recurring payment. In the case of a Paypal account holder, it must be reactivated by the Paypal account holder. Any Paypal rep that tells you otherwise is giving you incorrect information. Their reactivation link that they supply to us on this side of things simply doesn't work, no matter what they tell you. However, you should be able to reactivate it yourself (above). Recooping skipped or failed payments: Sometimes we can click a link in our own SLT PayPal account to activate an outstanding balance to collect on it, but it doesn't reactivate your subscription. You will need to do that yourself or renew your subscription and cancel your old one, if all else fails in trying to get your subscription started again. Just email support and let them know what you have tried and what you have done, so we can make sure you're not going to be double billed in case something is overlooked. 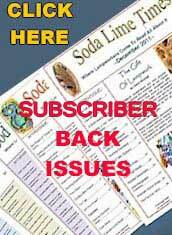 If my credit card is lost or stolen, what do I do about my Soda Lime Times subscription? From time to time a subscriber’s account will be cancelled by PayPal because the credit card they had registered as a back-up funding source was lost or stolen or the account was closed for some other reason. In cases like this you can go to PayPal to register the new card and re-subscribe using the directions above. It does take a few minutes to update with PayPal and re-subscribe, but once it’s done there is nothing more to do until the new card is set to expire several years down the road. Can I contact PayPal and talk to a real, live person? Yes, there really are living people working for PayPal and they are actually very nice and helpful. At the bottom of the PayPal home page is a Contact link. Click that and then select Call Us. You will be issued a one-time pass code that you will type in when you call. Listen to the choices, but just say "operator" and you will bypass the endless choices the machine gives you. Once an operator answers he or she should be able to help you with your account. We are also here to help if you'd rather talk to us in person than communicate by email. Just call us at 423.366.6335 EST and we'll be happy to help. May I subscribe using only my Credit Card? Yes, when you are ready to subscribe you get to choose whether you want to use PayPal or your credit card. Why is the magazine screen blank or some pages blank when I try to see it online or such a struggle to get the PDF files to load? This started happening sometime in June 2018, and after thoroughly investigating we found that members couldn't even fully load issues that they had saved in previous months. So something has happened with browsers and/or computer updates during June. We have some suggestions or possible causes below. This is not a technical issue with Soda Lime Times, itself. So please read what's below. Install or update your Adobe Reader software. It was made to open PDF files and we do not support the opening of our PDF in browsers. Should you have a problem with any particular browser, especially Microsoft Edge which no longer wants to open PDF files for some reason, you will need to contact your browser tech support. Browsers that seem to do well are Firefox and Opera. https://get.adobe.com/reader/ Uncheck the middle column that wants you to install McAfee because it will haunt your computer if you don't. I've found it rather hard to get rid of. 2. If you're using an iPhone, tap once on the PDF's first page until a drop down comes down asking you to open it in iBooks, but you should save a copy for backup on an external drive for safety because some members' iBooks suddenly had none of their past issues loaded anymore. You should always save the monthly issues to a hard drive or jump drive for safe backups. 3. The member may not have let the PDF file fully load before saving it to their computer, or clicked to save too fast. If you do not let the PDF magazine fully load, sometimes it can end up being saved with some blank pages because you saved it too soon without letting it load all the way. 4. The member may be using a browser such as Microsoft Edge or Google Chrome. If opening in a browser, the ones which haven't had any reported problems (to us) are Firefox and Opera. The member could open the PDF in a browser, let all the pages load by viewing them while scrolling up and down and THEN save the issue to their hard drive or jump drive. This isn't a guaranteed fix but has worked for some members. 5. The member may need to update their software, device, browser or even their computer operating system and drivers. 6. The member may be having conflicts with browser plug-ins/add-ons. Disable them to see if that fixes the problem. I'm afraid we can't support or fix these types of technical problems. However, the recommended program of Adobe Reader can be download here https://get.adobe.com/reader/ Uncheck the middle column that wants you to install McAfee because it will haunt your computer if you don't. I've found it rather hard to get rid of. For other topics, please visit our FAQs page on our website. Please understand that this is not a technical problem with Soda Lime Times but we will continue our watch for any news about what happened with Microsoft, Google and Apple in June for any fixes that actually do work. Until then, Adobe Reader is your best friend. Every month we upload the new issue to our website on the last day of the month so that it is available to you by the first of the month. At any time after we upload the issue subscribers can log onto our site and get the new issue. We email our subscribers each month as the new issue is published. The new issue is available to you for a full month before we replace it with a new issue. Please note that at the time a new issue becomes available, the previous issue will no longer be available. So, be sure to get your current issue during the month of publication. The new issue replaces the old issue on the first day of each month. I'm not getting emails from the Soda Lime Times. What is happening? Do I need the email to get the issue? No, we send the emails to our subscribers as a courtesy, but you can access the current issue at any time, from any computer, by simply logging in either on the home page or on the subscriber’s page. What happens if I forget to download and save an issue? Can I get a replacement? Yes, once you have purchased and issue we will be happy to replace it. Just email support@sodalimetimes.com and ask for a replacement. We do not keep any purchaser histories online, so your back issues are not available online. That is why we ask you to save them to your own computer each month. If you lose an issue, have a computer crash, or are missing any issues you have paid for, just email us and we are happy to help you. Do you have a free sample issue I can see before I subscribe? We sure do! We have a link on our homepage that will allow you to request a copy of our free sample issue. May I give the free issue to friends and family? Yes, please do. Better yet, if they come to our site and sign up for it they will be on our mailing list and will receive our emails that we send out from time to time with special offers, free tutorials, etc. We never send out an email unless we have something of value to share, so you don’t have to worry about us inundating you with emails. Can I send issues of the magazine to friends and family? Please don't. If you contact us we will be happy to help you purchase a back issue, or issues, for someone as a gift. But if you are a monthly subscriber or have purchased back issues, we ask that you not distribute them to anyone else. The Soda Lime Times is copyrighted material intended for your use only. It’s OK to show it to your friends so they can see what it’s all about, but we ask that you not email it to anyone. We understand that from time to time you may want to print a tutorial and take it with you to a Beads of Courage beadmaking day or to a lampwork retreat, and that’s fine. Just please don’t distribute links to the magazine or the PDFs without our prior permission. If you email them, you are subjecting Soda Lime Times to a loss of profit as the search engines will scrape your emails (especially Gmail) and has posted our issues for free online!! Please do not share our issues through email. What if I want to un-subscribe? 1. PayPal users: go into your PayPal account to do so. 2. Credit Card users: slip us an email to cancel your subscription. May I write an article or do a tutorial for Soda Lime Times? What is "BOC" and "LE?"